Unless you want to be stuck monitoring just one fishing hole for the entire trip, you are going to need tip ups. In fact, these mechanisms have become so useful, you will be hard pressed to find an ice fisherman that doesn’t carry tip ups. They help you to cover a great area under the ice and also make it easier to work at multiple depths at once! The reason that it can be so difficult to pinpoint the best ice fishing tip ups is because there is a wide variety of options to choose from. They are each made of different materials and have varying features. To take away some of the effort, I have created a list of what I found to function the best ice fishing tip ups. The products that have been included in this list are durable and adequately sensitive to the presence of fish beneath the ice. Ice fishing tips ups can either be made from plastic, metal, or wood. The early versions of tip ups were made of wood and even today, this material is still quite sought after as it is quite durable. After a while, of course, these tip ups will begin to break down. Plastic is quite popular because it is inexpensive and lightweight. These tip ups also tend to be brighter in color and thus, easier to see from a distance. One of the downsides of tip ups constructed from plastic is that they don’t hold up to the elements or extreme weather well. Metal tip ups are favored because they are incredibly tough and durable. Due to this, they can withstand terrible weather and are capable of handling heavier fish. The price you have to pay for these advantages, however, is added weight as these tips ups are quite hefty. These tip ups are reminiscent to some of the earlier designs, with the mechanism behind them quite simple. These types consist of three pieces of wood. Two create a cross formation on the ice with the third one being vertical. The bottom part of the vertical stick remains in the water while the top half is in the air. 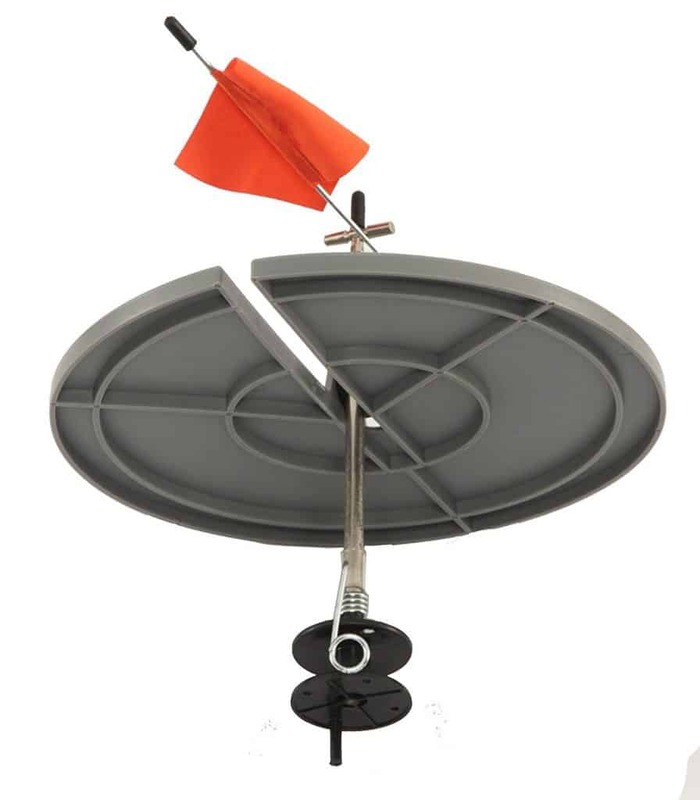 A flag is placed on the top of the third stick which, in turn, has a reel on it. If the reel is pulled, the flag will pop into the air. 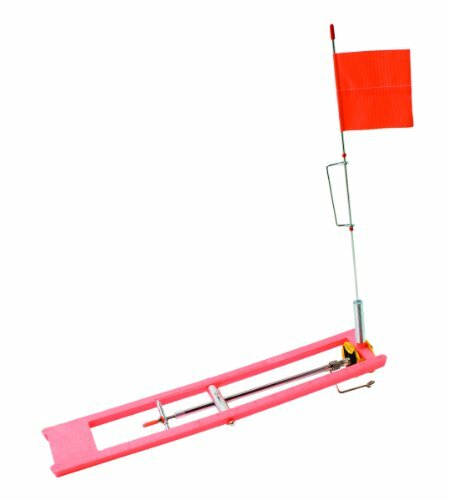 These tip ups are particularly useful in extremely cold weather when the fishing holes tend to freeze over quite quickly. The base on this product is round and can fit over a fishing hole. This prevents ice from developing here. The flag shaft is placed on the groove of the spool shaft, which is connected to the bait below. 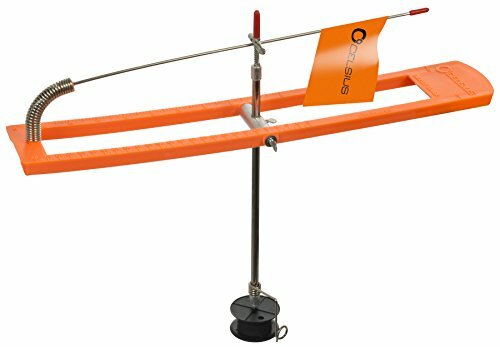 To be able to properly utilize a rounded base tip up, you will need to ensure that you have an auger that is able to create a fishing hole the same size as the tip up. Like the name suggests, wind tip ups have been specifically designed to be used in breezy or windy conditions. 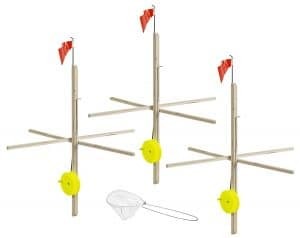 These tip ups come equipped with a small fin that causes the fishing line below to move in the water. These will not function properly when the wind is very strong, however. Here, the base is a long, thin rectangle, which can either be made of wood or plastic. 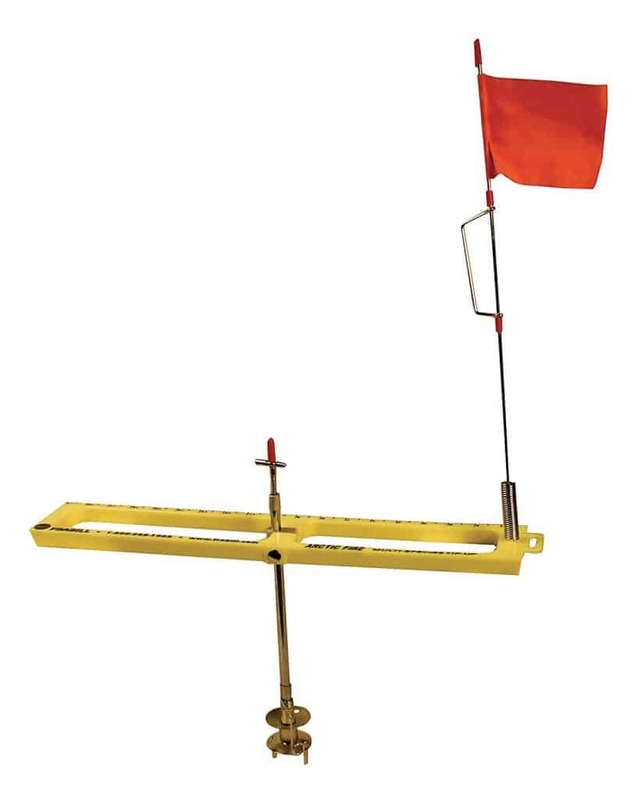 The flag shaft which has the spool must be positioned perpendicular to the base. Once the bait has been set, the flag shaft’s hook mechanism is placed on the pool shaft. The flag will be tripped when the line is pulled. In most instances, it is best to use the braided line as spool for the tip ups. This line is quite strong and is also easier to see against the snow. The other important part of any ice fishing tip up is the flag. There are only a few requirements when choosing the best possible flag for your device. First, you will need to ensure that the pole is relatively long and that the attached flag is also quite large. These two features are what will allow you to see the flag from a greater distance. Typically, you should look for flags and poles that can be seen even from 100 yards away. 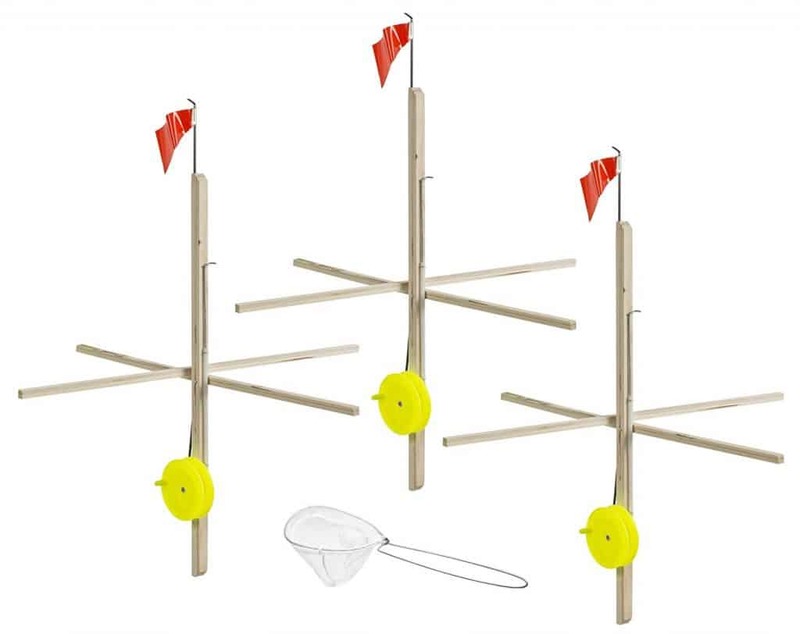 Flags come in a variety of colors and many ice fishermen often prefer to have a range to help them identify the different baits that they have used. Of course, the best flags are the ones that are most visible against the snow. For this purpose, red and orange flags tend to stand out the most. While yellow ones can be seen when you are close to them, they can look white from far away. This is what you need to keep in mind if you are looking for the best products on the market. Here I will discuss the features as well as the pros and cons of the best fishing tip ups you can buy. The Hayabusa Heritage Deluxe Wood Tip-Up is made of sturdy hardwood that is actually quite lightweight. The reel is made from polymer plastic and is complete with storage hook holes. The line capacity is 500 inches of 36-pound test. 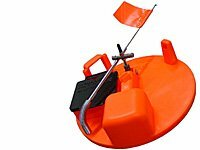 This ensures that most fish that will be caught during an ice fishing expedition can easily be handled. When upright, the flag is 45 inches long, which can easily be seen from far away. The flag is orange in color. What I enjoyed most about using this tip up was the simplicity that was involved. It was easy to set up, with the entire process completed in moments. Even when I was quite far away, I was immediately able to tell when the flag popped up. As the pole was so long, I was able to use it in deeper snow. Furthermore, the line was more than capable of handling anything that I caught. While the tip up is robust enough, it is unlikely that it will last for too long, especially when used in extreme weather conditions. The HT Polar Therm Extreme Tip-Up has been specifically designed to withstand freezing temperatures. The rounded base tip-up works to trap the thermal energy of the water beneath the ice, thus preventing ice from forming over the hole. The trip mechanism is freeze proof, which ensures that the trip level will not freeze over, regardless of how cold it gets. The trip set also has an adjustable tension which you can use depending on the type of fishing that you are looking for. This also means that the tip-up functions well even at deeper levels and when hunting for bigger fish. The base is made from durable plastic, with it capable of withstanding incredibly low temperatures and other bad weather. The HT Polar Therm Extreme Tip Up lives up to the expectations. The functioning is smooth and efficient and the flag pops up immediately after the line is tugged on. Also, this is the perfect tip up to have if you are planning on fishing in incredibly cold weather. This is especially since there’s no need to monitor the hole to stop the ice from forming. The adjustable trip tension is also a handy feature, particularly if you like to fish in different types of bodies of water. There isn’t a lot to complain about this tip up. The only criticism is that the pole, even when extended is a bit short. Being just 22 inches long, you can’t stay too far away from away from the flag, if you want to see it. The molded base on the Frabill Blackhawk Assault Tip Up is incredibly sturdy, steadying the entire device on the ice. It is also made from durable and is quite capable of withstanding most of the weather experienced during ice fishing. This tip up has already been pre-lubed with Sub-Zero lubricant. This prevents the shaft from freezing up even when temperatures near freezing. The design utilizes a shaft in shaft feature so that the piece can easily be removed and re-greased when required. The tip up is also equipped with dual trip settings. What really makes this tip up stand out is the dual trip setting. This helps to stabilize the entire device, particularly when the wind is incredibly strong and there is always a chance of false positives. The other thing that I noticed about this was that the base balanced out the tip up, making sure that it stayed in one place. The base also consists of a sixteen-inch ruler. At this price point, you will be hard pressed to find a more efficient tip up. Although there are no overwhelming problems, there are two minor points of contention. The first is that while the Blackhawk Assault works well in very cold temperatures, it may begin to suffer at below freezing temperatures. The Eagle Claw tip up has a strong base made from plastic. Due to the bright colors of both the base and the flag, it is easy to identify this device as being yours. It has been constructed to be wind resistant. This way, not only will the tip up stay put, you will also not be fooled by the flag falsely being moved by the wind. The line capacity for this tip up is impressive 65 yards! The base also doubles as a sixteen-inch ruler. If you are fishing in a popular or crowded spot, there’s no need to figure out which tip up is yours. With unique coloring and a flag with a logo on it, you can identify your flag with ease. The other thing that I admired about this tip up was the smooth functioning. 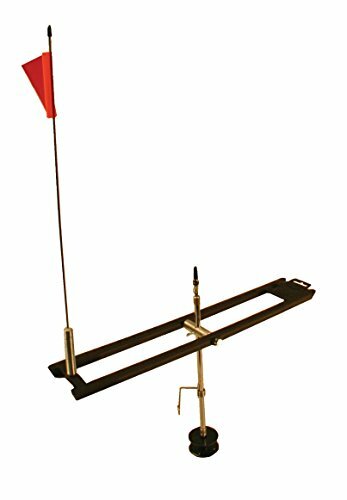 All of the mechanisms work effortlessly, causing the flag to pop up without any delay. The line capacity is also excellent. A good part of the product, including the reel, is made from plastic. This makes it less durable and also less resilient against harsher climates and weather. This 10-inch rounded base, Frabill tip up is certainly an efficient tip up. It works well in icy temperatures, keeping fishing holes from freezing over. Another reason that this tip up is well-suited to cold temperatures is because it has been liberally greased with Sub-Zero lubricant. This helps a great deal to prevent the tip up from jamming up when the temperatures begin to drop. Furthermore, the device has adopted a shaft in shaft design which lets you re-grease it when needed. The spool shaft on this tip up can be removed and replaced. It also comes with dual trip settings. This Frabill tip up can easily be your go-to device when heading out into frigid, windy temperatures. The base ensures that the fishing hole remains covered at all times and that no ice forms over it. The dual trip settings mean that the sensitivity of the tip up can be adjusted to two separate levels. 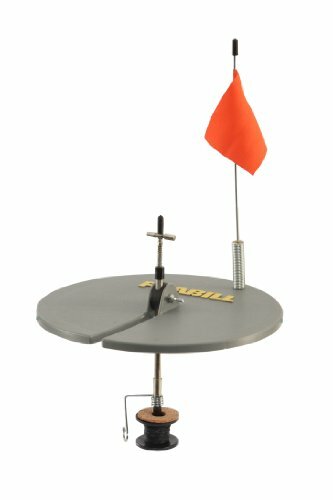 This allows you to eliminate the possibility of getting a false reading when the wind is blowing strongly. The main issue with this tip up is that you need an auger that is precisely 10 inches so that the hole is the same size as the tip up. While the device will work even if the hole is not the right size, the base will not be as efficient at preventing the hole from freezing. The Celsius SBTU-50 tip up is a simplistic yet durable setup. The base and the flag are both bright orange, making them stand out brightly against the snow. While the tip up is made from plastic, the type of plastic used is ABS. As a result, this is actually quite a hardy frame. It also comes pre-spooled so that you can start fishing almost immediately. This flag is made from plastic rather than fabric which minimizes the amount of movement due to the wind. The base is equipped with its own ruler. My favorite part about the Celsius SBTU-50 is just how visible it is, even from far away. It also makes it simple to identify when there are other fishermen around as well. The other plus point is that despite its light weight, this tip up is actually capable of withstanding a lot. This is undoubtedly one of the easiest tip ups to use, even children can manage it without a problem. The plastic flag can be a liability when it is folded down. It has a tendency to crease and looks as though it may break with continuous use. These are the best products that you can buy if you are looking for an efficient tip up for ice fishing. It is always important to make a choice based on the elements specific to you. This includes the type of fish that you hope to catch and the conditions that you are most likely to encounter. This is the best way to determine which tip up is right for you.